Elvira Mistress of Felinity, here, with a postscript of sorts to our recent kitten rescue adventure. As readers of this blog know Houston has a serious stray animal crisis on its hands, a problem exacerbated by the fact that far too many dogs and cats, both stray and those with homes, are not fixed. This got me to thinking of a way to express my concern about this issue via my talent for poetry. Daddy Kiril has been reading a book containing the creative writing of the cat loving, 19th century British, artist, poet and storyteller Edward Lear so, at night, I have been finding time to read the book, too, while daddy sleeps. Good evening, felinity assembled, Sneakers the Texian Tuxedo here...with what happened when Daddy Kiril took the kittens to our vet, Dr A, of Lakeside Animal Clinic, this afternoon. Daddy took them on the bus and the kittens were a curious, well-behaved, little group. Once at the vet, however, opinion seemed to be split on what to think as they waited to be put in a room for the check-up. Good evening, felinity assembled, Sneakers the Texian Tuxedo here...with what happened once Daddy Kiril brought 3, recently born, kittens home yesterday. Like you the photos in this series are the only looks Elvira & I have had at the little ones. We can hear them, though, and hear their interactions with daddy. He put them in the walk-in closet, after moving things around a bit, then brought a water bowl and made a make-shift litter box out of a baking pan, with low sides. After introducing the kittens to the mysteries of taking a whiz and a dump in litter...he dashed off to the market for a couple of cans of Friskies turkey & giblet pâté. The poor little cuties were STARVING! The one on the left took right to it, while the others dug in once daddy got them to lick a bit of food off his finger. 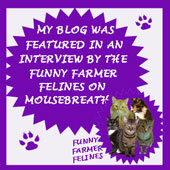 Daddy posted the news on his social sites, sent an email to some friends and called his friend Mom Chandra, of Life From a Cat's Perspective. 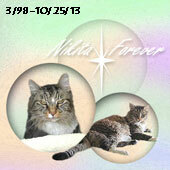 He also called our vet to set up an appointment, which will be Friday afternoon. As first time visitors the kittens will get looked at free, which is a blessing for daddy, under our present situation. Daddy was rushing about, like this, because he had to go to work and soon. 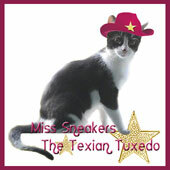 Good evening, felinity assembled, Sneakers the Texian Tuxedo here...and boy do I have some exciting news to share! Yesterday morning Daddy Kiril was sitting at the computer, with Elvira, watching as she worked on the Carnival of the Cats and I was napping...when a knock came at the door. A worker at our apartment complex had something he wanted daddy to see. He said he thought of us because he knew of Elvira and I and believed we and daddy could help. He took daddy down to the courtyard and introduced him to 3 very tiny, very chatty, kittens! Daddy stood there, stunned...but only for a moment; he bent down to look at the little bundles of energy, too young to realize the gravity of their situation and knew what he had to do. Where the heck did you find them? The man said he was walking by a wall, at a building in another part of the complex, when he heard tiny cries from within. He busted a hole in the wall and pulled out the 3 kittens, uninjured, frightened and hungry. It took great patience on daddy's part, but he eventually got the story out of the babies. When you see the full photo of this spot and realize what happened...you, like us, will wonder how they survived and how many of their , combined, 27 lives were used up to do so. If you are a human most likely you are scratching your head in puzzlement, just as Daddy Kiril once did. The stories are legion...and legend...you just have to know where to look to discover them. So, even if you are a native Texan, don't feel bad. I turned a year old last week and have done a lot of thinking about my future and just what being the first Texian Tuxedo in this, the 21st century, means. My predecessors were all independent, curious, strong-willed and opinionated; storytellers, poets and passers on of news from the human and feline worlds wherever they went. None made their homes among humans, at least not permanently, always finding some reason to move on. 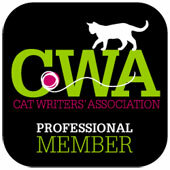 They actively engaged in helping their fellow felines in many ways as well. 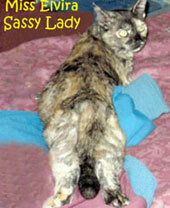 I am the first to take up permanent residence as an indoor cat, as well as the first female. The age of the internet, Daddy Kiril has explained to me, allows for those who use its tools, both human and animal blogger, to do things in ways their ancestors could never dream of doing. Daddy posed us with a new lanyard he had made, last month, waiting for the right moment to début them. After the events of yesterday Elvira told me it was time for me to share MY photos; She would wait to share hers when the moment, mention earlier, finally occurs. I am learning to be all those things the lanyard describes, just as Nikita was and Elvira learned to be; She and daddy have taught me so much and helped me think about a lot of things. Today is National NO KILL DAY! Click on this link to learn more about it, including how to support and help this effort. 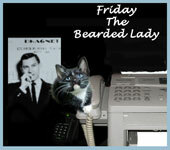 Elvira Mistress of Felinity, Daddy Kiril, and I, wish every day could be a NO KILL DAY for all shelter animals. In April I wrote a series of posts on the No Kill Animal Shelter Revolution. In our sidebar, under the heading of Rescues & Shelters, you will find a collection of No Kill related links, and links to some important exposes. Last month I presented a series of posts on the No Kill Animal Shelter Revolution. Several days after this post I got a couple of tips from a reader calling themselves "Ontario No Kill Advocate", who didn't leave a website for themselves, but shared some interesting links to more reports on PETA. In March/April/May, Huffington Post Canada columnist Douglas Anthony Cooper did a terrific , 5 part, expose on PETA, culminating in a discussion of Nathan Winograd, & the No Kill Movement, as an altertanive to PETA, and the familiar Shelter procedures. In Part 1 he writes: "Nobody does the euthanasia thing quite like PETA, Ingrid Newkirk's vaunted animal-rights organization. After long being dismissed as an outrageous slander -- just another right-wing slur -- this gruesome truth has finally gained traction in the mainstream press: PETA's headquarters in Norfolk has the highest kill rate in the nation. A rescued pet has the same chances of surviving PETA's sanctuary as it does of receiving genuine love and affection from Michael Vick." His piece goes a lot further than just observing that nice Humans should not be taking off their clothes in support of euthanasia of pets at Animal Shelters. Fame and prettiness are potent gifts among the Humans, and should be flashed wisely, he says. nice Humans, he writes should not be convincing equally nice Humans to give their Green Papers to an outfit that "kills pets, indiscriminately, at a rate that would shock seal hunters." Along the way he has a few choice words for even some of those organizations that lead the fight against PETA, apparently simply because their politics may differ from his, but I don't hold this against him, because he DOES acknowledge the good work they have done in exposing PETA. He also provides links to exposes by other leading magazines. READ: "PETA's Celebs: Naked in the Name of Mass Pet Slaughter." "PETA, for reasons near impossible to comprehend, decided to devote itself to precisely the treachery that inspired Newkirk's mission in the first place. Her organization now routinely takes in animals, with the gentle lie that it intends to re-home them. It then exterminates them. Generally within twenty-four hours. All of them." Why does PETA conceal its intentions from rescuers? Why does PETA do so much of what it does that is detremental to Animal Welfare efforts? Why does PETA's literature "describe euthanasia in terms that can only be considered pornographic"? Mr. Cooper goes into great detail, with links, to provide answers to these, and other questions. His discussion of the beliefs of Newkirk, and how PETA doesn't give a damn for the helpless, is an eye opener. READ: "Ingrid Newkirk's Death Wish." "Nathan Winograd believes that PETA's founder, Ingrid Newkirk, is mentally ill. That to him is the only credible explanation for her monstrous compulsion to kill healthy shelter animals. In contrast, I have argued that she is fully rational: Her viciousness has its own internal logic; moreover, it is counterproductive to psychologize evil. The answer is that it's not about being correct. It's not about his argument trumping mine, or his having the higher moral ground. It's not about us at all. It's about the animals. If what we do is right for the millions of abandoned creatures consigned to shelters, that's all that matters. Everything else is unimportant. And I have determined -- I am convinced -- that Nathan Winograd's No Kill program is the best thing to happen to the world's domesticated animals in my time. Perhaps ever. It is a genuine revolution, of the sort that it is a privilege to experience: we are living in one." READ: "The Humane Alternative to PETA's Pet Slaughter."